Today life is moving at a much faster pace for kids than what it used to be during our childhood days. 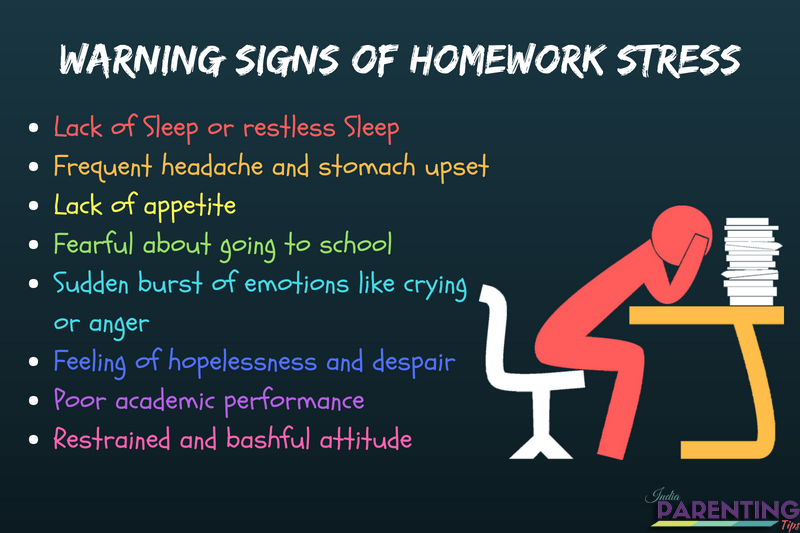 One of the widespread ‘stress’ recognized globally is ‘homework stress’. Wait for a second! Is homework a stress? Is it really stressful for the child or we are overprotective and spoiling them? That’s a question that comes to our mind when we deal with this concern. In this article, I plan to bring out the reality to know when homework can be termed as stressing. Is it stressful in absolute term or it is relative to individuals and situations? How can we as a parent identify if a child is stressed due to homework and what should be our role in helping them out of this problem! Lastly, I would also provide some useful tips to reduce homework stress. So stay hooked in to get some awesome tips and complete knowledge of how to handle your child’s homework stress. The practice of giving homework had initially begun with a positive objective of ensuring that whatever lessons are taught in school are revised and reviewed by the students at the end of the day at home. The purpose of completing homework is to ensure independent handling of problems and making them through with the day’s lesson. Parents, on the other hand, get assured that their child is being taught properly and is taking time to learn his lessons at home. All these are some of the positive intentions behind assigning homework tasks to students. But these positive aspects and intentions embitter as it is often not managed properly by the authorities concerned be it a teacher or school authorities. Surprisingly the age at which such homework stress is affected is as low as Lower and Upper kindergartens. Alarming right? To make things worse, teachers often give non-productive homework that has nothing to do with revision or developing cognitive or learning skills. Example: Students are asked to write answers by copying from the textbook's word for word. This has nothing to do with developing creating writing skills or analyzing things. All it does is to add more and more stress to the child rather than developing their skill sets. Hence I am sure now we can answer the question (Can homework be stressful) in one simple word-Yes! Now the next question might appear, "Should we do away with Homework?" The answer to this question is debatable. While homework altogether has been banned in French society as early as from 1956, In India, The Central Board of Secondary Education, CBSE, had asked its affiliated Schools not to assign homework to students of Grade 1 and 2 and they need not bring school bags loaded with books to School. This is one positive step to relieve students of lower grade to do away with homework stress. In U.K, the Association of Teachers and Lecturers also supports a complete ban. According to the government rules for primary schools homework should not be assigned more than 1 hour per week for year 1 and 2 following which 1.5 hours per week for year 3 and 4 and not more than 30 minutes per day for Years 5 and 6. In the U.S., the National Education Association (NEA) follows a policy of 10 minutes rule which means homework should not be more than 10 minutes per grade per night for the students. Therefore, my personal viewpoint as a parent and as a facilitator is that homework should not be completely eliminated but it should be modified and replaced with positive action based interesting worksheets based on what has been taught in the class. Example it could be some home-based experiment or some interesting problem-solving quizzes. However, homework should not be exhausting for the child as well as for the parents. Depending on the age of the children, the time taken to complete the assigned tasks should not exceed more than 7-10 mins per day. Further, the homework should be such which students are able to do all by themselves without involving parents or any tutors. As a concerned parent, the following signs might help us to identify Homework stress. Lack of Sleep or restless Sleep. A frequent headache and stomach upset. Fearful about going to school. A sudden burst of emotions like crying or anger. The feeling of hopelessness and despair. Surprisingly and more shockingly most parents often push their child to work more and more with their assigned tasks as if to try to excel in becoming expert clerks in future. I have come across many parents who feel that no homework from school means no studies at all. They feel school must give homework no matter how difficult it is for the child so that they can feel reassured that their child is studying and learning. So first and foremost it is very important for we as parents to be educated about the concept of homework stress and how badly it can affect our child. In trying to fulfill our contemptuous desire they are ruining the child’s present and future. Understand that your child is still a child and he deserves to be treated as a kid. If he feels the pressure of work, he should be handled with love, care, and understanding. 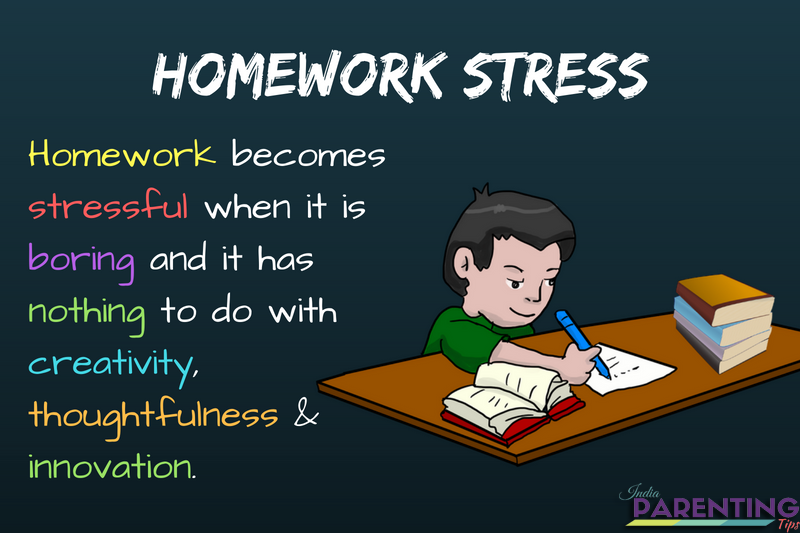 Check out if the child feels stressed about doing homework for a particular subject or is it overall stress that he feels. Check the child’s daily tasks and introspect if it is too much for him to handle or not. In case there is a growing concern regarding homework stress take an appointment with the school authorities to discuss your particular concern. Catch up with other parents of the same school and grade and create a platform for common discussions which can help everyone. You may use any social networking sites or group chats for this. Ensure that your child feels comfortable and relaxed at home and is able to express his or her opinion without any fear or anxiety. Choose a particular time of the day to spend some quality time with the child and also you can also plan to be around while the child completes in homework. This is just in case the child feels insecure or stressed. Keep some chocolates around and reward the child time and again to make him feel appreciated and encouraged. Chocolates are real stress busters. Plan some weekend stress bursting activities for the child to relieve from homework stress and pressure. These are some of the cool tips which I thought I should share. I hope it might be of help to all my readers who are amazing conscious parents. Do share your feedback which can be highly encouraging.